Maybe the reason that the accordion is my favorite book form is the family history of accordion playing. Here is a photo of John Roman's Accordion School Class of 1938 in Linden, NJ. My father is in the back row, the eighth in from the left. Here is something I wrote to accompany a photograph at a memorial display I exhibited at the Newburyport Public Library in 2000. My father wanted desperately to play the accordion, and to play it well. He worked hard, delivering newspapers first and then working for a peddler, to earn the money to take lessons and buy an instrument. 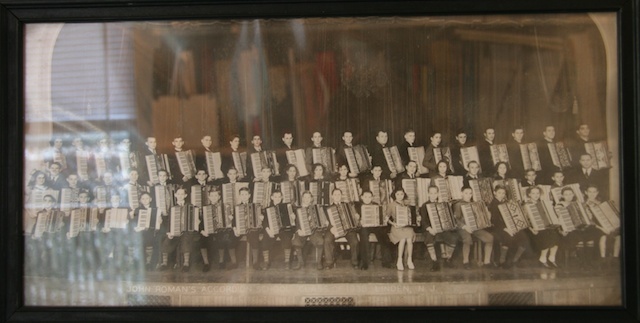 Every week he took the bus to Linden with his accordion for a lesson at John Roman’s Accordion School. He got the first part of his dream, but the second eluded him, and eventually he stopped taking lessons. I still have his accordion with Alfred in sparkling letters. In later years, he would sometimes play for his own pleasure. I was required to follow the tradition but it didn't go as smoothly. My ability to memorize encouraged my teacher (also in Linden and one of my father's classmates) which led to the requirement of more and more practice. When the expectation grew to an hour and a half a day and my mother got fed up with fighting with me to sit down with the accordion, lessons ended, although not without tears. I take out my accordion very rarely now (maybe once every ten years) and spend my time with the book version of the instrument. Practice... the downfall of many a tiny musician. I can remember jumping up to sit on my accordion case while I wait for my lesson. I was so young, my feet didn't touch the floor when I sat on the case. It was a child sized instrument, but still felt enormous on my lap. The only reason I agreed to the lessons was because I believed my father would sit with me while I practiced. He didn't - and me and mom never did get very much out of the lessons. Good thing it was only a rented accordion. What a wonderful story, my sister and brother both played, not really well, but practice was their downfall as well. When I packed up my mother's house, I'm not sure which of them took it. My dad was a self taught musician, he and his brother, my uncle, would haul out any old instrument they could find at a reasonable price, usually a violin or clarinet, and play for the sheer pleasure of it, my brother in law would accompany them on his accordion, now there's a gifted musician. P.s. I like the accordion book as well.